Revamped bar menus at California Pizza Kitchen sport hand-shaken cocktails like this California Roots drink—made with Svedka Vodka, fresh avocado and mint, fresh Agave Sour with a fennel salt rim. Photo courtesy CPK. Also quite tasty, the Hand-Shaken Agave Mojito, with Bacardi Superior Rum, Fresh Agave Sour, Fresh Mint and Lime and Organic Hawaiian Sugar Cane, and the super pretty Blueberry Ginger Smash, with Jack Daniel’s Tennessee Whiskey, Monin Organic Agave Nectar, Domaine de Canton Ginger, Fresh Blueberries and Lime, and Cranberry Juice. Certainly one of their most unique new items is the California Roots cocktail, which includes mashed avocado—as well as Svedka Vodka, fresh avocado and mint, and fresh Agave Sour with a fennel salt rim. California Pizza Kitchen (located here in Santa Barbara at 719 Paseo Nuevo) also has a nice, Seasonal Harvest Sangria, made with Bacardi Superior Rum, St. Germain Elderflower and Kendall Jackson Chardonnay with Muddled Grapes, Basil and fresh Agave Sour. Their solid, California-focused wine list is also good and they offer a “wine adventure guarantee,” which means if you taste a new wine and aren’t thrilled, they’ll replace it for free. Not bad way to end (or start) a day of shopping at Paseo Nuevo! Click here for more cocktail corner columns. Originally published in Santa Barbara Seasons Magazine on June 26, 2015. Like many immigrant families, the Manzo-McKaig patriarch came to the U.S. to pursue the American Dream. Mission accomplished. 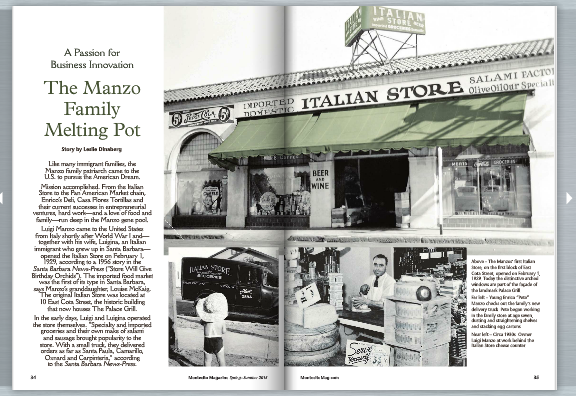 From the Italian Store to the Pan-American Market chain, Enrico’s Deli and Casa Flores Tortillas, to their current successes in entrepreneurial ventures, hard work—and a love of food and family—run deep in the Manzo-McKaig gene pool. 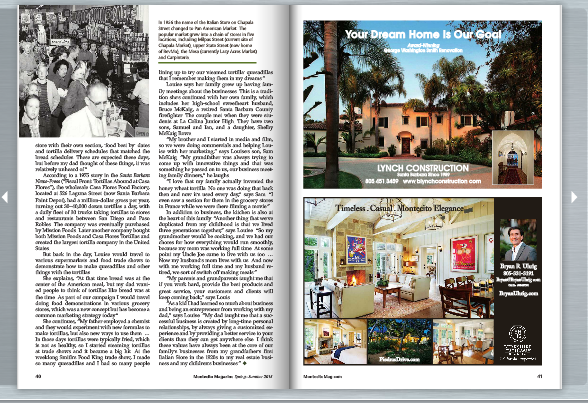 Luigi Manzo came to the United States from Italy shortly after World War I, and together with his wife Luigina, opened the Italian Store, on February 1, 1929, according to a 1956 story in the Santa Barbara News-Press (“Store Will Give Birthday Orchids”). The imported food market was the first of its type in Santa Barbara, says Manzo’s granddaughter, Louise McKaig, The original Italian Store was located at 10 E. Cota St., the historic building that now houses the Palace Restaurant. In the early days, Luigi and Luigina operated the store themselves. “Specialty and imported groceries and their own make of salumi and sausage brought popularity to the store. With a small truck they delivered orders as far as Santa Paula, Camarillo, Oxnard and Carpinteria,” according to the Santa Barbara News-Press. “My Grandma always told me she came through Ellis Island [also from Italy] when she was nine,” says Louise. “She said that her father and his brother went to work in the coal mines in Oklahoma.” According to the 1930 U.S. Census records, Luigina arrived in this country in 1915, and classified herself as an “unpaid worker, member of the family” at the “Family Grocery Store” in Santa Barbara. 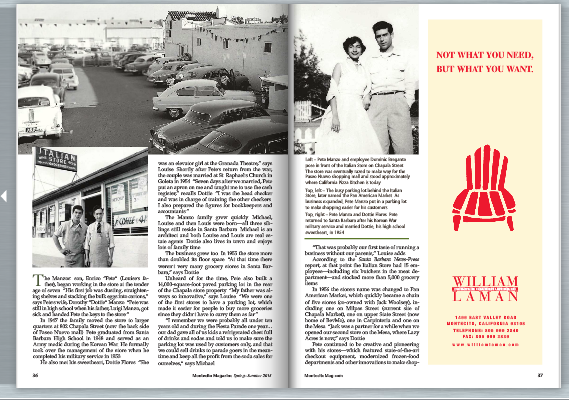 In 1947, the family moved the store to larger quarters at 802 Chapala St. (now the back side of Paseo Nuevo Mall). Enrico graduated from Santa Barbara High School in 1948, and served as an Army medic during the Korean War. He formally took over the management of the store when he completed his military service in 1953. The Manzo family grew quickly. Michael, Louise and then Louis were born—all three siblings still reside in Santa Barbara. Michael is an architect and Louis and Louise are both real estate agents. Dottie also lives in town and enjoys lots of family time. The business grew too. In 1955 the store more than doubled its floor space. “At that time there weren’t very many grocery stores in Santa Barbara,” says Dottie. “I remember we were probably all under ten years old and during the Fiesta Parade one year … our dad gave all of us kids a refrigerated chest full of drinks and sodas and told us to make sure the parking lot was used by customers only, and that we could sell drinks to parade goers in the meantime and keep all the profit from the soda sales for ourselves, says Michael. “That was probably our first taste of running a business without our parents,” says Louise. According to the Santa Barbara News-Press report, at that point the Italian Store had 15 employees—including six butchers in the meat department—and stocked more than 5,000 grocery items. In 1956, they changed the store’s name to Pan American Market, which quickly became a chain of five stores (co-owned with Jack Woolsey), including one on Milpas Street, where Chapala Market is now, one on upper State Street where Bev Mo is now, one in Carpinteria, and one on the Mesa. “Jack was a partner for a while when we opened our second store on the Mesa, where Lazy Acres is now,” says Dottie. Enrico continued to be creative and pioneering with his stores—which featured state-of-the-art checkout equipment, modernized frozen-food departments and other innovations to make shopping easier. He was also always cutting edge with his marketing strategies. One such promotion delighted local children. “We had a store in Carpinteria,” says Louise, “and my dad had this friend who was a helicopter pilot fly over the store dressed as Santa for Christmas.” Helicopter Santa also visited the Mesa store, according to Dottie. This kind of attention-getting stunt wasn’t being done at that time; it was unheard of, Louise says. “Growing up, my brothers, Mike and Louis and I spent a lot of time at the grocery stores. Most of the employees were like aunts and uncles to us,” recalls Louise. “I remember bagging groceries for customers, stocking shelves, unloading cases of food off delivery trucks and miscellaneous repairs around the stores, ” says Louis. “There were a lot of good characters and we had a lot of fun times,” says Michael. “One time there was a butcher who wasn’t very nice to us. My dad suggested we give him ‘Happy Pills.’ So the next time he wasn’t being nice, my brothers and I made a little jar with M&Ms and wrote ‘Happy Pills’ on it,” says Louise. “After that he was a lot nicer to us,” adds Michael. Of course, the Manzo business doors didn’t stay closed for long. “We sold the stores because we wanted to go into our next businesses,” says Dottie. That next business was Casa Flores, a brand of tortillas. “For Casa Flores Tortillas the boys were our route managers, in charge of the trucks and routes while Louise and I ran the day-to-day of the business, accounting, payroll, human resources, scheduling of over a hundred employees, and the office side of things. The main office headquarters were located on Laguna Street,” says Dottie. According to a 1975 story in the Santa Barbara News-Press (“Fiscal Front: Tortillas Abound at Casa Flores”), the wholesale Casa Flores Food Factory, located at 526 Laguna St. (now Santa Barbara Paint Depot), had a million dollar gross per year, turning out 30-40,000 dozen tortillas a day, with a daily fleet of 30 trucks taking tortillas to stores and restaurants between San Diego and Paso Robles. The company was eventually purchased by Mission Foods, which is now the number one tortilla company in the United States. But back in the day, Louise would travel to various supermarkets and food trade shows to demonstrate how to make quesadillas and other things with the tortillas. Louise—an agent with Village Properties—says her family grew up having family meetings about the businesses. This is a tradition she’s continued with her own family, which includes her high school sweetheart husband Bruce McKaig, a retired Santa Barbara County Firefighter. The couple actually met when they were students at La Colina Junior High. Louise says she still teases Bruce that he’s not really a native Santa Barbaran because he didn’t move to town till he was six months old. They have two sons, Samuel and Ian, and a daughter, Shelby McKaig Rowe. “My brother and I started in media and film, so we were doing commercials and helping Louise with her marketing,” says Samuel. “My grandfather was always trying to come up with innovative things and that was something he passed on to us, our business meeting family dinners,” he laughs. “My parents and grandparents taught me that if you work hard, provide the best products and great service your customers and clients will keep coming back,” says Louis. “Dad taught us to treat our employees and coworkers the way you want to be treated. He always made sure that everyone in the company was taken care of,” says Michael. 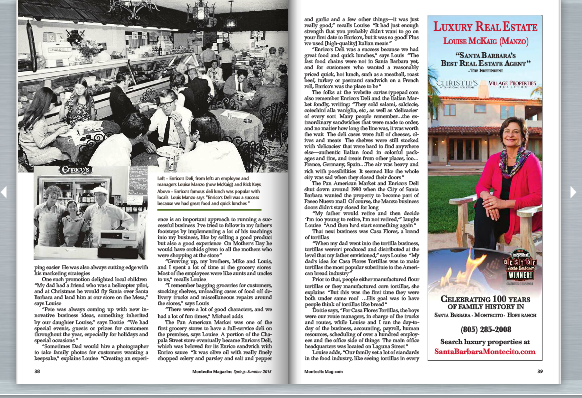 Originally published in Montecito Magazine, Spring-Summer 2015. Want to learn how to make delicious tamales? Expert tamale chef Richard Lambert of Santa Barbara Tamales to Go teaches an interactive class on how to make traditional tamales from 2-3 p.m. on Sunday, June 28 at the Bacara Resort & Spa (8301 Hollister Ave.). In what’s sure to be a fun—and tasty—afternoon, Lambert teaches the techniques he uses to make his firm’s award-winning tamales and salsas. Santa Barbara Tamales To Go Owner/Chef Richard Lambert will teach a tamale and tequila tasting class at the Bacara on Sunday, June 28. Courtesy photo. Guests are served a variety of tamales and each tamale is paired with an expression of Tequila Alquimia, a gold medal cognac-like sipping tequila. The enrollment fee is $30 per person and includes food, tequila, printed recipes and handout materials. Click here to purchase tickets. Originally published in Santa Barbara Seasons Magazine on June 22, 2015. Casa del Herrero, courtesy photo. George Fox Steedman and his wife Carrie moved into their new home on June 29, 1925. Now we have a chance to celebrate “father of Santa Barbara style” George Washington Smith’s architectural legacy with a special garden party. Casa del Herrero, 1387 E. Valley Rd., Montecito. June 28, 4–7 p.m. 805/565-5653, casadelherrero.com. Living in a world-class vacation destination like Santa Barbara has a bounty of blissful benefits, but sometimes it’s still nice to get out of town for a bit. Here are a few favorite spots that are less than a day away from home. Relaxation and indulgence go hand-in-hand on Catalina Island, where you can enjoy being pampered at Island Spa Catalina. Courtesy of Santa Catalina Island Company. This beautiful getaway—just 22 miles off the coast of Southern California via Catalina Express (800/481-3470, catalinaexpress.com), with ports in San Pedro, Long Beach and Dana Point—offers a little piece of paradise with striking clear-blue waters and a laid-back friendly vibe that Santa Barbarans will appreciate and feel right at home with. Avalon is a great walking town, with no cars allowed in much of the waterfront district and a charming path stretching from the Catalina Express boat moorings to Descanso Beach, a mile away. Descanso Beach Club (1 Descanso Ave., 310/510-7410, visitcatalinaisland.com) is a terrific spot for sunset cocktails. Poke into quaint shops like the eye-popping Afishionados Gallery Store (203 Crescent Ave., 310/510-2440, shop.afishionadosgallery.com), which has wonderful one-of-a-kind jewelry and art, and C.C. Gallagher (523 Crescent Ave., 310/510-1278, ccgallagher.com), a coffee house/wine tasting room that also carries high-end gifts, or pop into Lloyd’s of Avalon Confectionery (315 Crescent Ave., 310/510-7266, catalinacandy.com) for sweet treats. Explore the island further with a visit to Wrigley Memorial & Botanic Garden (1402 Avalon Canyon Rd., 310/510-2897, catalinaconservancy.org) or by renting a golf cart at Catalina Auto and Bike Rentals (635 Crescent Ave., 310/510-1600, catalinaislandgolfcart.com). Avalon’s newest restaurant, Maggie’s Blue Rose (417 Crescent Ave., 310/510-3300, maggiesbluerose.com), features innovative Mexican cuisine (try the mole braised duck taquitos, the watermelon and spiced grilled shrimp salad and the fabulous grilled street corn on the cob, which is “derailed” tableside) and an extensive margarita selection (think tamarindo, cucumber and jalapeno, and desert pear flavors). We also enjoyed a fantastic ocean-view dinner at another newbie to the island, Bluewater Avalon Seafood Restaurant (306 Crescent Ave., 310/510-3474, bluewatergrill.com). Located in the historic Avalon waterfront building that once served as the arrival and departure point for the SS Avalon and SS Catalina steamers, the restaurant offers a contemporary take on the classic New England seafood house. To truly feel pampered, check out the brand-new Island Spa Catalina (163 Crescent Ave., 310/510-7300, visitcatalinaisland.com), which offers 15,000 square feet of indoor bliss, as well as a variety of outdoor spaces, including luxurious lounges, a soaking pool and the stunning turquoise-tiled vista deck. The spa features nine treatment rooms, a nail studio (the blend bar mani/pedi is a special treat for the senses), and light bites at Encanto Café. It’s a wonderful place to spend the day with friends (girls’ weekend treat or pre-wedding pampering). Many people come to Catalina for a day trip, and that’s certainly do-able, but if you stay at the delightfully charming Pavilion Hotel (513 Crescent Ave., 310/510-1788, visitcatalinaisland.com), you may never want to leave! Renovated in 2010, this cozy hotel is a mere 14 steps from the beach. If you don’t want the sand in your toes, Pavilion Hotel has a spacious garden courtyard area, complete with fire pits, where you can enjoy the ocean view along with complimentary wine and cheese pairings, as well as an excellent continental breakfast. For more info on this destination, or to request a free visitor’s guide, visit catalinachamber.com. Just when you thought there couldn’t possibly be anything new under the sun in the world of pizza, Santa Barbara has an addition to the local menu with a truly inspired idea: at the new(ish) PizzaRev in Paseo Nuevo, each pizza, no matter how many ingredients are selected, costs $8.25. That’s right, no more agonizing over pepperoni vs. pepperoncini, or sweet fennel sausage vs. sun-dried tomatoes. Have them all, the only extras you’re charged for gluten-free dough or vegan cheese. Not only that, we’ve been a few times and PizzaRev is quick and tasty. Perfect for a before or after movie bite, PizzaRev features a distinctive “Craft Your Own” pizza assembly process and Roman-style thin and crispy pizza. Start by selecting your crust selection (original or gluten-free), then choose from four signature sauces, including a savory organic red sauce, a creamy white alfredo, plain olive oil and a spicy-sweet BBQ. Then, each personally-sized pizza is topped with favorite selections from an array of all-natural cheeses and 30+ fresh artisanal ingredients, ranging from traditional favorites to more unusual selections—they even have vegan sausage! Plus, they only take three minutes to flame fire each pizza. Pretty impressive. Salads are also available, and don’t forget to try the Dessert Pizza, a decadent treat made with Oreo crust! Interesting factoid: PizzaRev founders and longtime entertainment industry executives Irv Zuckerman and Rodney Eckerman were co-CEOs of Clear Channel Entertainment, and booked the likes of U2, RollingStones and The Who in their heyday. Rodney’s son, Nicholas, pitched the idea of “build your own” pizza after recognizing the void in the fast casual industry. His culinary and customer service background with Ritz hotels helped fuel the PizzaRev product. It was Irv and Rodney’s business sense that brought the concept to life—they opened the first three locations in the LA area in less than seven months. PizzaRev is located in Paseo Nuevo at 12 W. De La Guerra St. (right next to the movie theater). For more information, click here. Originally published in Santa Barbara Seasons Magazine on June 17, 2015. Stephen Duneier with one of a series of yarn-covered boulders he created at Lizard’s Mouth. Photo by Scott London, ScottLondon.com. Artists often use their work to provoke discussion or emotion, but Yarnbomber Stephen Duneier’s colorful creations are site-specific installations designed to get people out to the middle of nowhere. In this case, “the middle of nowhere” is Santa Barbara County’s plethora of hiking trails. Duneier’s seven projects to date include creating an Alien Campsite on Davy Brown Trail; a series of covered boulders at Lizard’s Mouth; a reflective starfish above the pools at Seven Falls; a spider web at Sasquatch Cave in the playgrounds of Lizard’s Mouth; an enormous boulder on Saddlerock Trail; an ongoing Guinness Book of World Records attempt to create the world’s largest crocheted granny square; and creating his first project—cloaking a 40-ft. tall eucalyptus tree on the Cold Spring Trail’s east fork with a gigantic knitted sweater—which took place in 2012, just 82 days after he picked up knitting needles for the first time ever. All of Duneier’s projects are done in a way that doesn’t permanently disturb nature, with permission from the U.S. Forest Service. “The forest service has actually been really supportive, now that I have a track record with them, and they know that I’m not just some guy who wants to use the land for my own purposes,” he says. The other consistent element in a Yarnbomber project is that the installations stay up for just nine days. “The first weekend is all about people just stumbling onto it, then there are five days during the week, when nobody goes hiking very much. The second weekend is all about word–of–mouth. It sort of builds…but I don’t really want crowds; I just want it to be on people’s radar. And having it for nine days, you can’t procrastinate. You’re either going to go see it and make the effort today or you’re just not going to see it,” says Duneier. The projects, many of which are done in collaboration with artists from around the world, have opened up a world of new experiences for Duneier, whose day job is writing about and managing investments, as well as teaching Decision Analysis at UCSB’s College of Engineering. His next “grand vision,” launching sometime this summer, incorporates metalwork and gemstones. As to where and when it pops up, the website yarnbomber.com is the best place to stay tuned. Glamping Time! Talk about traveling in style! Each luxurious Bowlus Road Chief travel trailer is built to order and made from materials like birch, aluminum and brass, with the body joined together by more than 5,000 hand-bucked rivets to form a single, incredibly tough “monocoque” shell. Courtesy of Bowlus Road Chief LLC. Roger Miller sang about “trailers for sale or rent,” but if he were writing that old ditty today, “King of the Road” would surely include a chorus about the Bowlus Road Chief. Billed as “the world’s most advanced luxury travel trailer,” the Bowlus Road Chief was engineered by Hawley Bowlus in the 1930s (the same fellow who built the Spirit of St. Louis, flown by Charles Lindbergh), and the design inspired a host of aluminum competitors including Airstream, Streamline, Silver Streak, Avion and Spartan. As for the king of them all—the Bowlus—only 80 of these glittering riveted-aluminum capsule-shaped trailers were produced before World War II shut down the camper business. These beautiful silver machines are being manufactured once again right down the road in Ventura County by recent east coast transplants Geneva Long and her father John. The reimagined Bowlus Road Chief has the same sleek lines as the vintage models but with modern amenities like solar panel hook ups, heated floors, central heating, beds that convert from twins to a king, indoor/outdoor showers, Wi-Fi charging stations and a cook’s kitchen. Plus, at 24 ft. long and 2,000 lbs, the Bowlus can legally follow just about any automobile. Each model is custom-built to order: the 2015 Bowlus Road Chief runs about $110,000. For more info, call 855/926-9587 or visit bowlusroadchief.com.